Against Chabot last weekend, Rams sophomore running back Jahray Hayes scored four touchdowns to help CCSF advance. 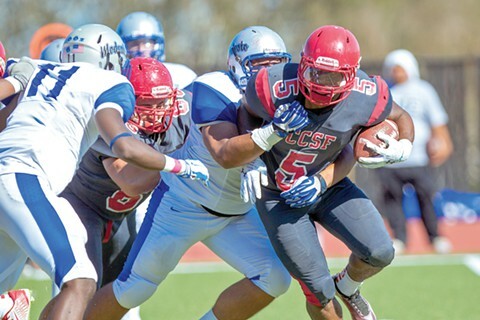 Following its comprehensive 47-20 home win over Chabot, the City College of San Francisco football team faces American River for the Northern California championship. A Rams win in Saturday’s 1 p.m. semifinal at CCSF books passage to the California Community College Athletic Association state championship game. But given that American River dealt CCSF (10-1) its lone loss of the season, a 13-0 setback on Sept. 27 in which the Rams struggled to move the ball, this weekend’s showdown takes on greater significance. Anthony Rodriguez, CCSF’s sophomore quarterback, who completed just 12 of 37 passes in the loss to American River, has been excellent since. In addition to throwing 18 touchdowns to just four interceptions this season, Rodriguez has completed nearly 60 percent of his passes. The Rams have won their past seven games, a surge exemplified by their 23-7 win over rival College of San Mateo on Nov. 15. Against Chabot last weekend, Rams sophomore running back Jahray Hayes punched in four touchdowns, each from within 20 yards. Hayes now has 21 rushing scores on the season, top in the state. Hayes’ dependability factors into CCSF’s red-zone proficiency: The Rams have scored on 49 of 57 opportunities in 2014, including 44 touchdowns. Couple that with defensive efficiency. The Rams allow just 15.2 points per game, which ranks first in the state. Safety Shalom Luani, who forced a fumble and nabbed an interception against Chabot, helps compile a sturdy sophomore core. Tavita Faaiu, a defensive end whose 14.5 sacks rank fifth in the state, has also forced five fumbles. Defensive back Uriah Harris has six interceptions. Should CCSF defeat American River, the Rams will meet the winner of the Southern California championship between Riverside and Mount San Antonio. Pepiot to nationals: With a 15th-place finish in the West Regional Championships last weekend, Academy of Art junior Valentin Pepiot became the second cross country runner in program history to qualify for the Division II national meet, which takes place on Dec. 6 at Tom Sawyer Park in Louisville, Ky.
Osakue leads Gators: San Francisco State men’s basketball coach Paul Trevor expects big things from 6-foot-5 senior forward Udun Osakue this season, including scoring. In a 68-59 win over crosstown rival Academy of Art on Tuesday, Osakue obliged, finishing with a team-best 18 points on 8-of-12 shooting. The Gators are 1-1 to start the season. Walk-on debut: Troy Rike, a 6-7 forward who was named honorable mention West Catholic Athletic League last season while at St. Ignatius, earned a roster spot on Wake Forest’s men’s basketball team following walk-on tryouts. In a 75-48 win over Nicholls State on Monday, Rike made his Demon Deacons debut. His first point came on a free throw, and he also added an assist.